What Day Of The Week Is May 20? 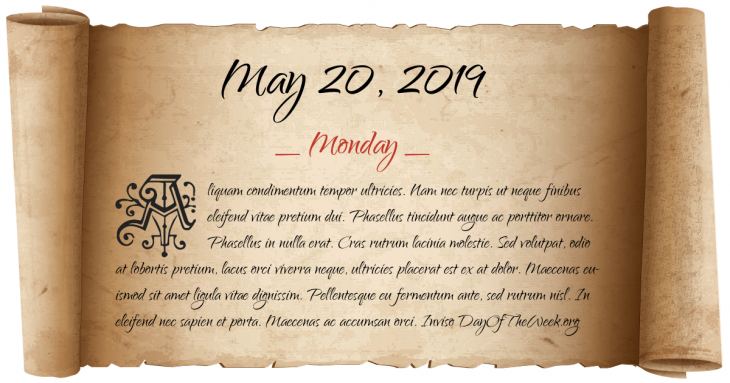 May 20, 2019 is the 140th day of the year 2019 in the Gregorian calendar. There are 225 days remaining until the end of the year. The day of the week is Monday. Portuguese explorer Vasco da Gama arrives at Kozhikode (previously known as Calicut), India. American Civil War: Battle of Ware Bottom Church – in the Virginia Bermuda Hundred Campaign, 10,000 troops fight in this Confederate victory. Montreal, Quebec radio station XWA broadcasts the first regularly scheduled radio programming in North America. Treaty of Jedda: the United Kingdom recognizes the sovereignty of King Ibn Saud in the Kingdoms of Hejaz and Nejd, which later merge to become the Kingdom of Saudi Arabia. Holocaust: The first prisoners arrive at a new concentration camp at Auschwitz. In the United States, the Armed Forces Security Agency, the predecessor to the National Security Agency, is established. In a referendum in Quebec, the population rejects by a 60% vote the proposal from its government to move towards independence from Canada. The first post-Communist presidential and parliamentary elections are held in Romania. Who were born on May 20?